"The Internet of Thing is here," Michael Dell proclaimed at Dell World. "But only 80% of devices today connect to the internet." The IoT revolution requires new ways to store and analyze massive amounts of data, and Dell is showcasing new solutions to help kickoff the industrial Internet of Things revolution. 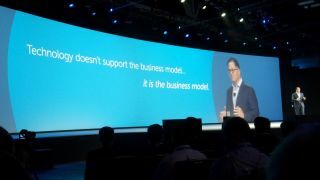 The Gateway is purpose-built for automation, Mr. Dell said, and it can connect to any devices, any hub and any endpoint. "Big data is about big results, big outcomes and big success," Mr. Dell said. The company is working with partners to deliver these results to customers who require the industrial Internet of Things. "The Dell Edge Gateway sits at the edge of the network (near the devices and sensors) with local analytics and other middleware to receive, aggregate, analyze and relay data, then minimizes expensive bandwidth by relaying only meaningful data to the cloud or datacenter," Dell said in a statement. "Dell is expanding capabilities out to the gateway. This means companies can now extend the benefits of cloud computing to their network edge and for faster and more secure business insights while saving on the costly transfer of data to and from the cloud." Dell also announced a new version of Statistica and a partnership with Microsoft to help customers analyze data. "An easy-to-use solution that requires no coding and integrates seamlessly with open source R, Dell Statistica delivers a full range of data blending, data discovery, and advanced and predictive analytics tools that help organizations tap into all data to predict future trends, identify new customers and sales opportunities, explore "what-if" scenarios, and reduce the occurrence of fraud and other business risks," Dell said. In one example, Dell worked with the University of Ioawa Hospitals and Health Systems to analyze infection rate. The result: infections dropped by 58%. Dell is also expanding its Analytics as a Service offerings with the new Dell Service Desk Analytics and Dell ModelHealth (DMH) Tracker. "The competitive advantage will be based upon analyzing vast quantities of information and being able to deliver new insights and business opportunities," Mr. Dell said of the IoT market. "Companies that cannot do this will be gone." The CIO's role, according to Mr. Dell, then is to chase growth and increase opportunities and money while at the same time reducing cost. The anchor tenant in this infrastructure is compute: everything must run on a servers. Dell announced new servers in the 1U and 2U form factors in the DSS line. Dell's DSS7000 Series is the densest server on the market. Mr. Dell promises continued server innovation and enhancement with the EMC acquisition. Mr. Dell committed to open, independent ecosystems through the company's deals, partnerships and acquisitions for future growth. The datacenter is also becoming a private cloud. Combined with a public cloud, Mr. Dell said that the model for the future is the hybrid cloud. "We are innovating within and between the clouds," Mr. Dell said, highlighting the deal with EMC and VMWare.